Analog pre-amp featuring the revolutionary Nutube. Monster sound, minimal size – the MV50 is the ultimate modern amp. Like nothing you’ve ever seen! MV50 is a truly innovative approach to amplification. Don’t be fooled by its size and looks, the MV50 is a new concept in guitar amplification. Boasting 50W of power, the MV50 produces serious guitar sound that rivals conventional tube amps. With the MV50 you can harness the sound of a true tube amp at home, in the studio, or on the stage. Preamp driven by Nutube, the revolutionary new vacuum tube. 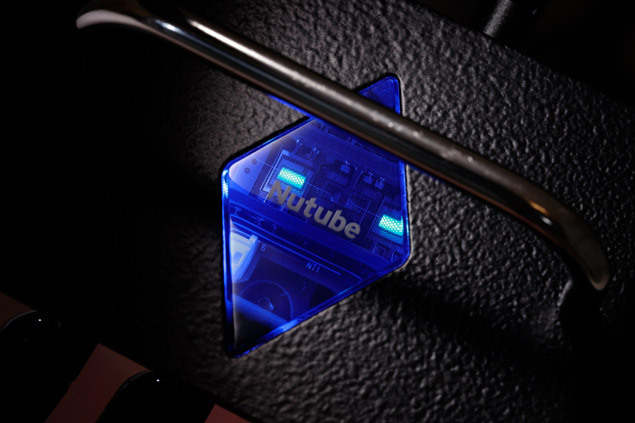 Nutube is a revolutionary new vacuum tube that has been met with much acclaim and adoration since its introduction in 2015. The MV50’s unique analog preamp design incorporates the Nutube to achieve authentic tube amp tone. Our engineers took full advantage of this incredible new tube technology to design a true, low power, low voltage miniature amplifier. While we may have shrunken the size of an amplifier, rest assured that true tube amplifier sound is alive in well. Guitarists of different styles and different genres prefer vastly different guitar tones. The MV50 is available in three versatile models that aim to serve players of all styles. Our “Clean” model provides a natural, undistorted sound with plenty of headroom. 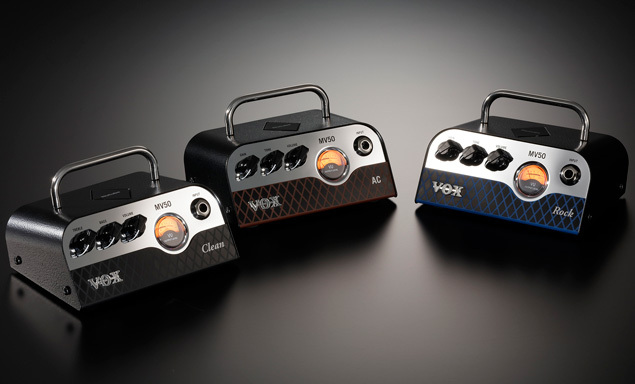 The “AC” model serves up the classic chime and distinctive crunch of a VOX AC30, while the “Rock” model delivers more aggressive high gain tones. Choose the MV50 model that suits your style, or collect all three! The MV50’s circuit was designed with an emphasis on analog and uses discrete components throughout its construction. Starting with the Nutube, all circuits consist of a staggering number of analog components. The MV50 also incorporates specially designed circuits with a variable operating point in order to more accurately reproduce the dynamic character of a traditional tube amp. The result of this unique circuit design is genuine guitar tone reminiscent of the great tube amps of the past. The MV50 features a quiet, reliable and efficient class D power amp. Specifically designed to interact with the unique circuit of the MV50, this power amp faithfully amplifies the character of the vacuum tube sound that’s generated by the Nutube equipped pre-amp circuit. In addition, the power amp design of “AC30” and “Rock” models will even reproduce the varying load that is distinctive of vacuum tube power amps. This circuit is crucial to the dynamic character of a vacuum tube amp, and is responsible for the natural sounding overdrive, its sensitivity to the nuances of your picking, and its fast response. The MV50 retains this design philosophy and provides an authentic playing experience. On the “Clean” type only, we’ve omitted this circuit in order to increase headroom, reduce distortion and supply the ultimate in clean sound. When using a smaller sized cabinet, your tone tends to suffer from the loss of low-end and accentuation of high frequencies. When connected it to a small-sized cabinet, such as VOX's new BC108, you can set the EQ switch to DEEP mode to retain a rich low-frequency range and prevent the high frequencies from taking becoming too pronounced. To accommodate connecting a large speaker cabinet, such as a conventional cabinet containing four 12-inch speakers, we’ve also provided a FLAT mode for the EQ switch. This gives you sound that takes full advantage of the characteristics of your speaker cabinet without impairing the MV50's potential. 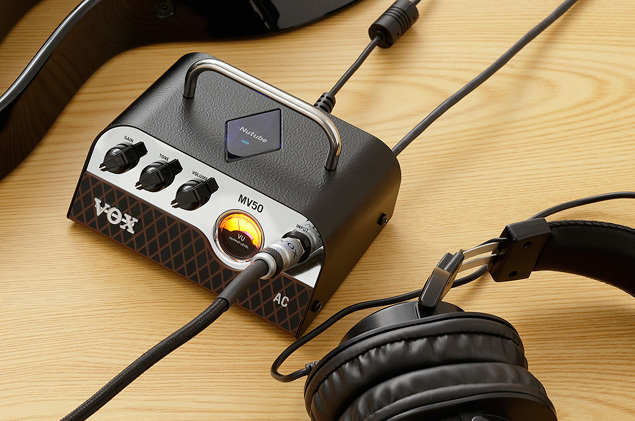 Since the MV50 also provides line/headphone output, it can be connected directly to a mixer or audio interface, allowing it to be used as a recording amp. The MV50 also features a cabinet simulator circuit that accurately reproduces the characteristics of a cabinet and the air it moves. Our cabinet simulation was based on the techniques of experienced engineers using highly regarded microphones and the most coveted vintage mic pre-amps, which means you can record with serious studio sound in any environment. 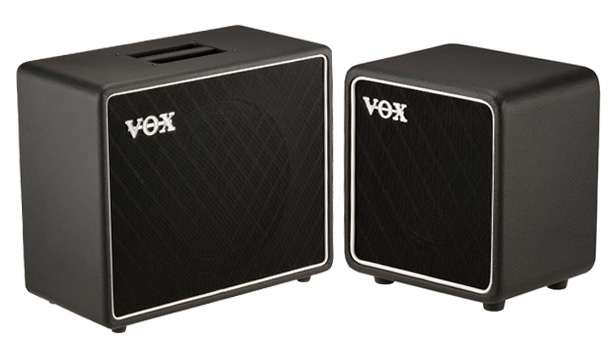 The BC108 is a small cabinet featuring an 8-inch speaker, and is an ideal companion for the MV50. With its carefully selected speaker and a meticulously designed semi-open-backed structure, it delivers a strong, punchy sound that you won’t believe comes from such a small cabinet. The BC112 cabinet is loaded with a 12” Celestion V-Type speaker and features semi-open back construction, an oval port that delivers punchy lows, bracing to increase cabinet resonance, and a front-mounted speaker for improved projection. Both units can handle up to 25W@8Ω output, and cascade-connecting two units will allow 50W@4Ω, allowing the full potential of the MV50 to be unleashed.